FTP, the File Transfer Protocol, is one of the original network applications developed with the TCP/IP protocol suite. It follows the standard model for network services, as FTP requires a client and a server , the first implementations of FTP date back to 1971. FTP set out to solve the need to publish documents and software so that people could get them easily from other computer systems. 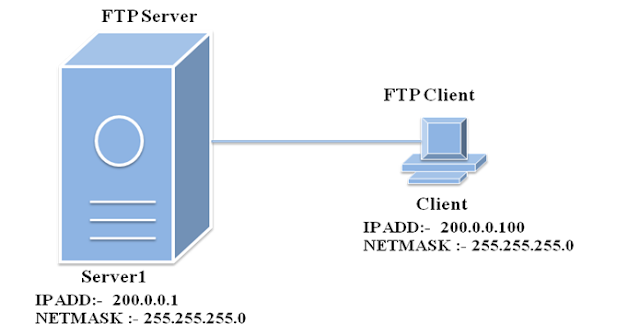 On the FTP server, files were organized in a directory structure; users could connect to the server over the network ,and download files from (and possibly upload files to) the server. The Very Secure FTP Server (vsFTPd) is the only FTP server software included in the Red Hat Linux distribution , vsFTPd is becoming the FTP server of choice for sites that need to support thousands of concurrent downloads. It was also designed to secure your systems against most common attacks. Note:- If you previously configured YUM server then VSFTPD package need not to be installed. It is already installed while configuring YUM server. Now open Mozila Firefox and type ftp://200.0.0.100/ in addess bar and press enter. You are able to access pub directory with the help of ftp service. Sameway you can access above link in windows operating systemas with Internet Explorer as well. [root@Client ~]# service vsftpd restart ……. [root@client ~]# chkconfig --level 35 vsftpd on ……. [root@Client ~]# ftp 200.0.0.1 ……. [root@Server1 ~]# vi /etc/vsftpd/ftpusers ……. [root@Server1 ~]# vi /etc/vsftpd/user_list ……. # do n[root@Client ~]# vi /etc/vsftpd/ftpusers ot even prompt for a password. Now go to Client Side and use ftp command to copy the file. Password: * * * * * ……. 227 Entering Passive Mode (200,0,0,1,76,87). 227 Entering Passive Mode (200,0,0,1,100,3). 150 Opening BINARY mode data connection for hellow (3 bytes). [root@Client ~]# cd /home/cms ……. [root@Client ~]# cat > welcome …….